A needlepoint blocking board is a lightweight, porous wood board with a grid of squares printed on it. 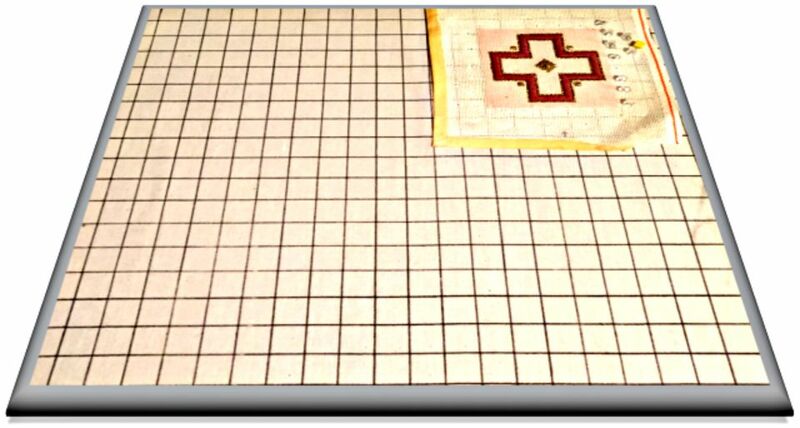 This grid is used as a guide for stretching warped diagonally-stitched needlepoint canvas back into shape during the blocking and finishing process. Blocking boards for needlepoint have to be strong enough to hold and pin out-of-shape stitched canvas as it is stretched and pulled back into its square grid. They come in several different sizes and types; with these three being the most common. Fabric Covered Blocking Board - This style of blocking board is made of insulated wallboard (commonly called drywall) and covered with heavy fabric like denim, muslin, or tightly woven linen that’s used in making bed sheets. One-inch squares are screen-printed on the fabric with colorfast ink. Soft Wood Blocking Board - This simple stretching device is made of pine or other soft wood with a grid of squares painted directly onto the board. it is sealed with clear acrylic to keep the painted grid from bleeding through and ruining the stitched needlepoint during the wetting and blocking process. This blocking board can be purchased through needlepoint, sewing, and knitting suppliers. Cork Blocking Board - The simplest of all blocking board types is made from cork, the same natural material that’s used in making bulletin boards. Like other types of needlepoint blocking boards, a one or two-inch grid is painted and sealed, usually on the smooth back of the cork board. Cork blocking boards are the do-it-yourself solution to stretching and blocking needlepoint. Not all blocking boards are appropriate for needlepoint. Foam or vinyl boards are best suited for knitting, crochet, and lace-making. Cardboard mats, like the ruled kind used for cutting fabric, can work for needlepoint as well; but not if the canvas is severely distorted. You'll need something stronger that will stay in place as well as allow for re-blocking the needlepoint multiple times in order to achieve a square shape. Blocking needlepoint is not as difficult as it may seem. Many stitchers shy away from blocking their own needlepoint because they are afraid they could damage the completed needlepoint project and all their hard work would have gone down the drain. Not true. With a simple inexpensive needlepoint blocking board, you can easily stretch and re-shape canvas that has been worked in traditional continental and half-cross tent stitches as well as other stitches with diagonal slants until it has returned to its natural shape. Gather together the needlepoint blocking board, a package or two of rust-proof push pins or T-pins, and a spray bottle filled with tap water. Spray the back of the canvas with water generously so that it can be stretched for blocking. Using the printed square grid on the blocking board, place a pin in the center of the top of the unworked area of wet canvas (the 2 to 3 inches of extra blank canvas left unstitched around a needlepoint design for this very purpose). Now gently stretch the canvas to fit one of the square grid markings at the bottom of the blocking board. Place a pin in the center here as well. Move to the center of each canvas side and place another pin. Return to the top of the canvas and begin stretching and pinning the canvas to the square grid and lines on the blocking board, working from the center outwards in both directions until the canvas is straight and no longer distorted. Spray more water as needed and continue this process for the remaining 3 sides, stretching the bottom first followed by the left and right sides. Re-stretch and re-pin as needed to remove canvas distortion.